Pioneer's 'G-clef' range, of which the A-A9 Mk2 is a part, was launched a couple of years ago and marked Pioneer's re-entry into the serious stereo separates market. One of the key features of the range was that it had been subjectively assessed and honed at Air Studios, George Martin's recording facility in Hampstead, where Pioneer has strong connections. Now in Mk2 guise, the products have been slightly revised, changes in this case including a revised volume control (now electronic rather than the single-turn potentiometer of the original version), tweaked circuit board layout for lower in-circuit impedances, and a modified power supply with low-loss, high-speed rectifier diodes and particularly low impedance. Internally, the Pioneer A-A9 Mk2 is a fully dual-mono design, at least as far as the power amplifier stages are concerned. Each of these has its own circuit board and heatsink and even its own toroidal mains transformer, which if nothing else, ensures that maximum output is the same when one channel is driven as it is when both are going gung-ho. 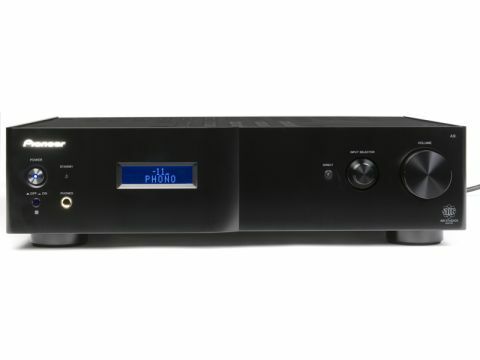 The preamplifier section is a conventional stereo board, including a phono stage switchable (at the rear) between moving magnet and moving-coil sensitivity. There is also a USB socket on the rear, intended for connection to a computer rather than a portable music player. This seems a sensible idea, incorporating a basic DAC which both upgrades computer audio performance and facilitates connection of a computer to the domestic Hi-Fi. On the whole, component quality within the A9 is, as one would expect, fairly basic. But Pioneer makes mention of the output transistors, which are fast multiple emitter types and help to give the circuit a high slew rate, often cited as an important factor for avoiding transient distortion. It's perhaps a shame that this amp was being compared with competitors – some of which cost quite a lot more – as its performance came in for some criticism. It's clearly not without merit, but our listeners felt that overall it lacked something in terms of drawing one into a performance. Since this was something that the (cheaper) Marantz amp was rather good at, we can't quite let Pioneer off the hook on grounds of value. If one comment summed up the reservations, it was that 'Everything is there, but it seems to be happening in the background'. Somehow, the aural image conjured up by this amp just doesn't seem as immediate as that produced by most of the others we tested this month. On the other hand, our listeners felt that the overall tonal character is fine, perhaps a little on the mellow side, but none the worse for that, while the images it produces are clear and stable, and detail is generally good. Presentation was described as smooth, and while that isn't necessarily a bad thing, it may simply be that it's really rather too smooth for its own good. It polishes not only the rough edges but also genuine musical information – those little details that may not be consciously perceived, but which bring music to life. As a result, there is not as much dynamic impact as one expects to hear from familiar tracks, nor is there quite the rhythmic precision and vitality. Bass is present but not always very well integrated with the rest of the frequency band, while high treble seems a little closed. At best, the sound is nice, but in the kind of unthreatening way that makes for great background music but disappointing Hi-Fi. This is a nicely turned-out product with good features, but it just doesn't seem to do the music thing as one would wish.